This one’s only really going to resonate with a certain bunch of readers! Anyone working in a public sector office environment will know of the dreaded internet blocks. Those tools that sit on corporate internet connections, making sure no one accesses naughty things during work time. Unfortunately this often encompasses sites which have practical use, such as social networking, tools like Google services and, my biggest bugbear, blogs. Blogs are huge. They are sources of information, allowing anyone with the right mindset (and some without!) to set up a news platform. A lot of the time this is purely to feed the individuals ego, but there are masses of blogs out there which can actually provide practical information which might actually help people do their jobs. If they could read them. Over the last month or so I’ve tried to share countless links with people who simply cannot read the content as they are denied access to the site the content is hosted on. Through discussions, I can see the issues IT have – site blocking is a blunt instrument, a canvas approach to catch everything including unsavoury websites. This approach is hard to manage to allow individual, one-by-one access; I’d have to tell IT every single website I’d like to be made accessible which is obviously something hard to think about when link sharing is a very spontaneous thing. So what to do. I could copy and paste content into an email, send it to the relevant people. But then it might get lost to the ether (granted, the same could happen to an emailed link) – what about a more permanent approach? On our network, we have a WordPress install which I use for development purposes. Being internal, this is not blocked to staff. 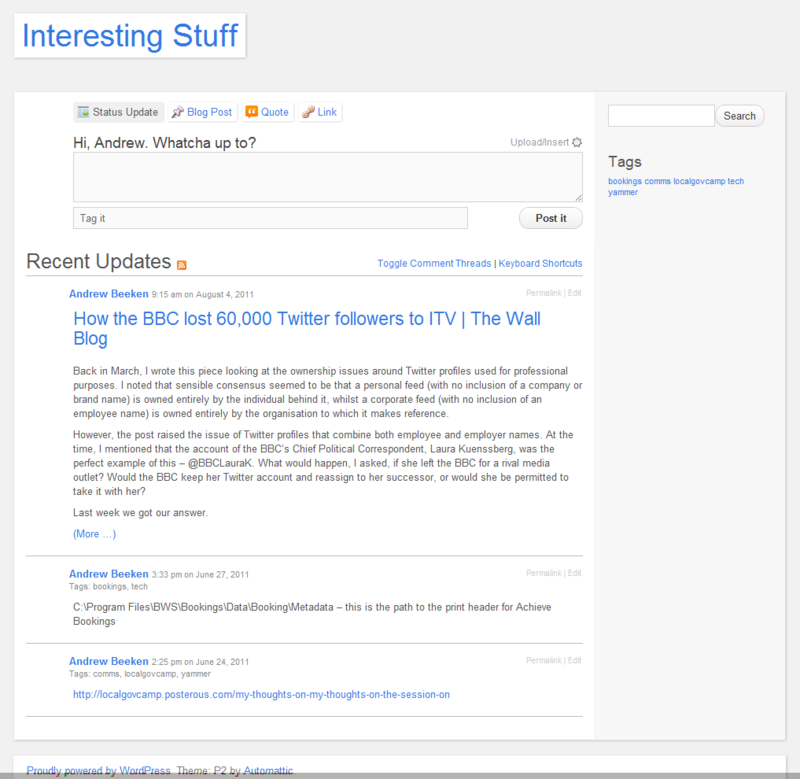 A few weeks back I set up an experimental blog called “Interesting Stuff”. The idea would be that I (and other members of staff) could use this to share and tag links and information internally, creating an information base that could be shared across the authority. I decided to use P2 as the theme to keep things simple. While the blocking made link sharing tough to do, I remembered a tool that can be used with WordPress called Press This. Available in the Tools menu on a WP blog, you set it as a bookmarklet, select a bunch of text on a page which you want to share, hit the Press This link and boom – instant post. I tried it out on this link http://wallblog.co.uk/2011/07/25/how-the-bbc-lost-60000-twitter-followers/ which had previously been blocked. I have to say it works VERY nicely, immediately turning the selected text into a post which can be tagged, categorized and published. Now people can read the article and content in our own domain without having to be blocked. What this doesn’t do is allow people to read the post comments which can often be just as valuable as the main post, however it is a start to trying to get this kind of information distributed around the authority. I’m going to start publicizing this, particularly on the new intranet we’re developing. For more information or to chat about any WordPress based projects you think I may be interested in, get in touch!